Cream together butter, cocoa powder and salt. Butter mixture will be very thick. Turn off the mixer, scrape down the sides of the bowl and add powdered sugar. Turn mixer on low and mix in powdered sugar while adding milk and vanilla extract. As the sugar incorporates, raise the speed of the mixer to beat the frosting. Beat until smooth. In a 2 cup measuring glass, stir together heavy cream and Ovaltine. Turn mixer speed to medium and pour cream mixture into frosting in a slow, steady stream, until you’ve reached your desired consistency. You may not need the full amount of Ovaltine and cream. 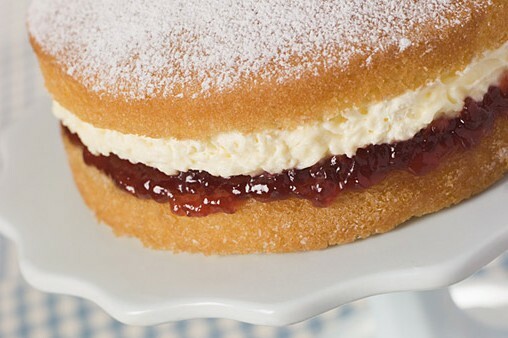 Top your cakes and cupcakes with this and sit back and listen to the appreciation! Yummy! Check out her recipe for the cupcakes! Sooo delicious! Put racks in the upper and lower thirds of oven and preheat oven to 350 degrees F.
Butter cake pans and line bottom with rounds of parchment or wax paper. Butter paper and dust pans with flour, knocking out excess. Whisk together boiling coffee and cocoa powder in a medium bowl until smooth, then whisk in milk and vanilla. Sift together flour, baking soda, and salt into another bowl. Beat together butter and sugars in a large bowl with an electric mixer at medium sped until pale and fluffy. Add eggs one at a time, beating well after each addition. Beat in flour and cocoa mixtures alternating in 3 batches, beginning and ending with the flour mixture (batter may look slightly curdled). Divide batter among pans and smooth tops. Place two pans in middle of oven and one pan in bottom of oven. Do not put top pans directly over bottom pans. Stagger them in the oven so the heat circulates. If you’re baking with a 9×13-inch sheet pan, feel free to bake on the middle rack. Bake, switching positions of pans half way through baking, until a wooden skewer inserted in enter of cakes comes out clean and layers begin to pull away from the sides of pan, 20- 25 minutes. 25-30 minutes for 9-inch rounds and 35-40 minutes for a 9×13-inch cake. Cool layers in pans on racks for 10 minutes, then invert onto racks, remove paper and cool completely. I covered my 9×13-inch cake with plastic wrap while still in the pan, and put it in the freezer to rest until I had time to frost it the next day. Once completely cool, put one layer right side up on a cake place and spread with about 1 cup of chocolate buttercream frosting. Top with fresh raspberries and add another layer of cake. Add another cup of frosting, fresh raspberries and the final cake later. Top with buttercream and frost the top and sides of the cake. If using a 9×13-inch pan, trim the sides slightly, and measure out the long side into three 4-inch sections. Slice, creating three 4×9-inch layers. Frost! Notes: These cake layers came be made two days in advance and kept, well wrapped in plastic wrap at room temperature. It can also be frozen for up to a week. I kept the cake frozen while I trimmed and frosted it. I think it’s easier and less crumby. The cake can be frosted one day ahead and kept refrigerated covered loosely in plastic wrap. Bring to room temperature before serving. You will need chocolate icing (frosting) have a look at the next recipe for it – sooo yummy! (serves 12) not if I get there 1st it won’t! 1. Preheat oven to 170°C. Grease and line base and side of a 6cm deep, 22cm (base) round cake pan. 2. Place chocolate in a heatproof, microwave-safe bowl. Microwave, uncovered, on MEDIUM (50%) for 1 to 2 minutes, stirring every minute with a metal spoon, until almost melted. Stir until smooth. Set aside for 10 minutes to cool. 3. Using an electric mixer, cream butter, sugar and vanilla until light and fluffy. Add eggs, 1 at a time, beating after each addition. Add melted chocolate. Beat until well combined. Sift flour and cocoa together. Fold half the flour mixture into butter mixture. Add half the milk. Stir gently to combine. Repeat with remaining flour mixture and milk. Spoon into prepared pan. Smooth surface. Bake for 50 to 60 minutes or until a skewer inserted into the centre comes out clean. 4. Stand cake in pan for 15 minutes. Turn out onto a wire rack to cool completely. Spread icing over top and side. Top with chocolate curls, if using. Serve. 5. To make chocolate icing: Combine chocolate and cream in a heatproof, microwave-safe bowl. Microwave, uncovered, on MEDIUM-HIGH (70%) for 1 to 2 minutes, stirring every minute with a metal spoon, until almost melted. Stir until smooth. Set aside for 30 minutes or until thick enough to spread. * To make chocolate curls, run a clean potato peeler down the side of a block of chocolate, allowing curls to fall onto a plate. * Taste.com.au is the place for food & recipes! Check out our latest collections including starters recipes, main recipes, drink recipes, Spanish recipes and autumn recipes. via Rich Chocolate Cake Recipe – Taste.com.au. A chocolate layer cake with sour cream and chocolate buttercream frosting. In a saucepan over medium low heat, combine cocoa, 3/4 cup sugar, 1 egg yolk, and milk. Cook, stirring constantly to prevent sticking, until thickened. Cool. Cream butter until light and fluffy; add remaining 1 cup of sugar, beating until well blended. Add 1 egg and 2 egg yolks; mix well. Stir in sifted dry ingredients alternately with sour cream. Add vanilla and cocoa mixture. Beat remaining (3) egg whites until stiff; fold into cake batter. Line bottoms of three 8-inch layer pans with wax paper. Pour batter evenly into the three pans. Bake at 350° for 30 to 35 minutes. Turn out onto racks and peel off wax paper. Cool. Frost with Chocolate Butter Frosting or your favorite frosting. Cream soft butter; gradually add sifted confectioners’ sugar. Add dash of salt, vanilla extract, melted chocolate, and about 3 tablespoons of cream. Beat until smooth and spreading consistency, adding more cream if necessary. via Chocolate Cake Recipe with Chocolate Frosting – Recipes for Chocolate Sour Cream Cake and Chocolate Butter Frosting. via Cupcake Bakeshop by Chockylit.